Flower of an Indian Lotus (Nelumbo nucifera). English : Flower of an Indian Lotus (Nelumbo nucifera). 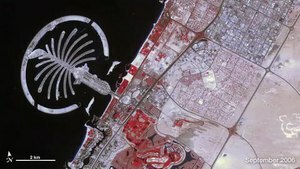 English : NASA time-lapse video shows the rate of Dubai's artificial islands growth at one frame per year from 2000 through 2011. In the false-color satellite images making up the video, bare desert is tan, plant-covered land is red, water is black and urban areas are silver. English : Show of new sport - Flyboarding on canal in Swedish city Malmö. Mir Castle Complex. Mir, Grodno Region, the Republic of Belarus. English : Mir Castle Complex. Mir, Grodno Region, the Republic of Belarus. English : The gallium beating heart is a chemistry reaction in which a drop of gallium is made to pulsate, like a beating heart. To make this experiment, melt a piece of gallium in hot 20% sulfuric acid and add to the solution several drops of 5% potassium dichromate solution. "All Marxist paths lead to Moscow! Therefore CDU" - This campaign poster, created for the West German federal elections of 1953, certainly ranks among Germany's most iconic political posters of the postwar period. It highlights Konrad Adenauer's stern anticommunist course, here directly aimed at the Social Democrats, then the leading party of the parliamentary opposition. English : "All Marxist paths lead to Moscow! Therefore CDU" - This campaign poster, created for the West German federal elections of 1953, certainly ranks among Germany's most iconic political posters of the postwar period. It highlights Konrad Adenauer's stern anticommunist course, here directly aimed at the Social Democrats, then the leading party of the parliamentary opposition. English : A demonstration of building of part of VR game for the HTC Vive. English : Cytoplasmic streaming in onion bulb scale epidermis cells. Recorded in Tallinn University of Technology. Upernavik cemetery from the southern end of the island in northwest Greenland on August 6, 2007. The construction work in the background was to expand the cemetery, which was running out of space. English : Upernavik cemetery from the southern end of the island in northwest Greenland on August 6, 2007. The construction work in the background was to expand the cemetery, which was running out of space. English : Fashion designer Frank Govers presents its new collection of summer fashion 1977. English : Several moments from mass in Strasbourg Cathedral, France. English : Video from several places in Huangshan, known in English as Yellow Mountains, in southern part of Anhui province in eastern China. English : Timelapse video of an emerging Common Clubtail dragonfly - Gomphus vulgatissimus, compiled from 2596 stills shot over a period of about 85 minutes - at 1 every 2 seconds. English : This is a recording of a suikinkutsu (水琴窟), a type of Japanese garden ornament and musical device that consists of an upside down buried pot with a hole at the top. Water drips through the hole at the top onto a small pool of water inside of the pot in order to create a pleasant splashing sound that rings inside of the pot. This recording was taken on December 27, 2005 at a tea house in Daisen Park (大仙公園) located in Sakai, Osaka. Beach chairs at the beach of Sellin (Rügen). English : Beach chairs at the beach of Sellin (Rügen). English : Hyperlapse video filmed around Brisbane, Australia. Shot with 5DMKII and 7D. Canon 24-70L, Sigma 70-300 and Samyang 14. Munich subway station Westfriedhof, opened in 1998. English : Munich subway station Westfriedhof, opened in 1998. English : Video based on data from NASA's Cassini–Huygens spacecraft shows a flyover of an area of Saturn’s moon Titan known as Sotra Facula. Scientists believe Sotra is the best case for an ice volcano - or cryovolcano-- region on Titan. The flyover shows two peaks more than 1,000 meters (3,000 feet) tall and multiple craters as deep as 1,500 meters (5,000 feet). Mooste manor steam mill with boilerhouse, Estonia. English : Mooste manor steam mill with boilerhouse, Estonia. English : The steam locomotive ČSD Class U57.0 departs from Osoblaha train station (Czech Republic). The Mir mine (a former open pit diamond mine) in Sakha (Yakutia), Eastern Siberia, Russia. English : The Mir mine (a former open pit diamond mine) in Sakha (Yakutia), Eastern Siberia, Russia. English : Video of recycling facility and processes. River Skjálfandafljót at Route 1 in northern Iceland. In the background is the spectacular waterfall Goðafoss. English : River Skjálfandafljót at Route 1 in northern Iceland. In the background is the spectacular waterfall Goðafoss. English : Dutch Newsreels from year 1958. – Demonstration of a ditch cleaning machine, which is used to deepen the ditches and throw the mud onto the land compared with farmer cleaning the ditches with shovels. English : Larva of greenhouse whitefly. English : The jellyfish Chrysaora achlyos (black sea nettle) swimming in a tank at the Monterey Bay Aquarium, California. The catholic Sacred Heart church in Munich, erected between 1997 and 2000, a rare example of contemporary church architecture in Germany. English : The catholic Sacred Heart church in Munich, erected between 1997 and 2000, a rare example of contemporary church architecture in Germany. English : Film from year 1907 of the heavyweight championship prize fight in box (Squires vs Burns). The fight was labeled the shortest and fiercest prize fight on record up to that time. English : The Snows of Kilimanjaro is an American Technicolor film based on the short story of the same name by Ernest Hemingway. The film was released on August 18, 1952 and starred Gregory Peck as Harry, Susan Hayward as Helen, and Ava Gardner as Cynthia Green. Fonte Gaia detail (built 1342). Wolves spouting water represent the mother-wolf of Remus and Romulus. Siena, Italy. English : Fonte Gaia detail (built 1342). Wolves spouting water represent the mother-wolf of Remus and Romulus. Siena, Italy. English : Waterfall Bluff is a waterfall in the Eastern Cape region of South Africa that falls directly into the Indian Ocean. The Siegestor in Munich, Germany, is a triumphal arch at the northern end of Ludwigstraße, one of Munich's grand royal avenues. English : The Siegestor in Munich, Germany, is a triumphal arch at the northern end of Ludwigstraße, one of Munich's grand royal avenues. English : Soviet cartoon from year 1941 - Barmaley. Gonates Cave at the bay of Plakias, Crete. The Gonates caves and tunnels were dug by the German army during the occupation of Crete in World War II. English : Gonates Cave at the bay of Plakias, Crete. The Gonates caves and tunnels were dug by the German army during the occupation of Crete in World War II. English : Aerial media of the Loonse en Drunense Duinen (Loonse and Drunense Dunes) national park in the Netherlands. Water mite (1.1 mm) under light microscope. The water mite is from a shallow freshwater pond in Omsk. English : Water mite (1.1 mm) under light microscope. The water mite is from a shallow freshwater pond in Omsk. English : Video from travertine terraces of Pamukkale and Hierapolis in Turkey. Living statue in Annecy, France. English : Living statue in Annecy, France. English : Who's Out There, a 1973 American documentary film on extraterrestrial life, produced by NASA and directed by Robert Drew, featuring Orson Welles. The film received in 1975 the CINE Golden Eagle award. Portrait of a young lion (Panthera leo), taken at Tierpark Hellabrunn, Munich. English : Portrait of a young lion (Panthera leo), taken at Tierpark Hellabrunn, Munich. English : Antonov An-124 Ruslan airplane landing at Gostomel Airport. English : Western reef heron, (Egretta gularis) in India. Bird is stirring the mud with its feet while foraging to disturb any hidden prey. English : The NASA astronaut Kjell N. Lindgren - short document from cosmonaut life. A traditional Munich beer garden at night. English : A traditional Munich beer garden at night. English : Drone recorded video of Crap Furo - 1204 m high cliff in municipality Albula/Alvra, canton Grisons, Switzerland. Immature bracket fungi Dryad's saddle Polyporus squamosus and beetles Diaperis boleti. Ukraine. English : Immature bracket fungi Dryad's saddle Polyporus squamosus and beetles Diaperis boleti. Ukraine. English : The Arctic Giant, the fourth of the 1940s Superman animated Technicolor short films released by Paramount Pictures from year 1942. Siproeta stelenes is a brush-footed butterfly in the family Nymphalidae found throughout Central and northern South America. Adults feed on flower nectar, rotting fruit, dead animals, and bat dung. This species is sometimes known as the malachite, named after a mineral which is similar in color to the bright green on the butterfly's wings. Photograph taken in the butterfly house on Mainau island, Lake Constance, Germany. English : Siproeta stelenes is a brush-footed butterfly in the family Nymphalidae found throughout Central and northern South America. Adults feed on flower nectar, rotting fruit, dead animals, and bat dung. This species is sometimes known as the malachite, named after a mineral which is similar in color to the bright green on the butterfly's wings. Photograph taken in the butterfly house on Mainau island, Lake Constance, Germany. English : Moth Gillmeria ochrodactyla on Tansy Tanacetum vulgare flowers, nature reserve "Kleine Lummersbach bei Cyriaxweimar" at Marburg, Hesse, Germany. Mountains surrounding the Uyuni salt flat during sunrise, Daniel Campos Province, Potosí Department, southwesten Bolivia, not far from the crest of the Andes. This salt flat is, with a surface of 10,582 square kilometers (4,086 sq mi), the world's largest, and during the rain season (December-February) offers spectacular reflections. English : Mountains surrounding the Uyuni salt flat during sunrise, Daniel Campos Province, Potosí Department, southwesten Bolivia, not far from the crest of the Andes. This salt flat is, with a surface of 10,582 square kilometers (4,086 sq mi), the world's largest, and during the rain season (December-February) offers spectacular reflections. English : The acrobatic air group Baltic bees on airshow Turku Airshow 2015, Finland. Front elevation of the church of St. Clement of Ohrid, Skopje, capital of the Republic of Macedonia. The Orthodox Cathedral church was designed by Slavko Brezovski and was consecrated in 1990, after 18 years' construction. This rotunda church, composed only of domes and arches on a 36 metres (118 ft) square plan, is one of the most interesting architectural examples in recent Macedonian history and is today the largest cathedral of the Macedonian Orthodox Church. English : Front elevation of the church of St. Clement of Ohrid, Skopje, capital of the Republic of Macedonia. The Orthodox Cathedral church was designed by Slavko Brezovski and was consecrated in 1990, after 18 years' construction. This rotunda church, composed only of domes and arches on a 36 metres (118 ft) square plan, is one of the most interesting architectural examples in recent Macedonian history and is today the largest cathedral of the Macedonian Orthodox Church. English : Helix is a steel roller coaster located at Liseberg in Gothenburg, Sweden. The ride, built by Mack Rides has a top speed of 100 km/h (62 mph). It features a 41-metre-tall (135 ft) dual-launch helix.